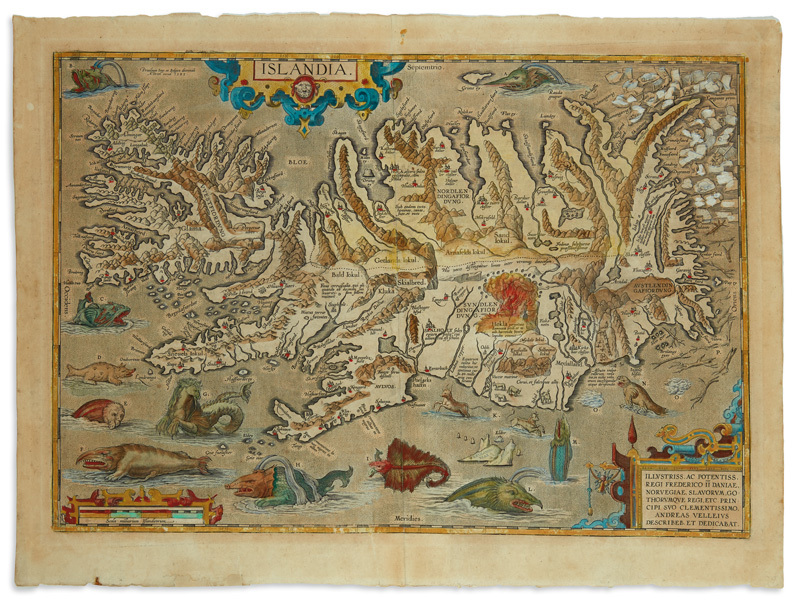 An example of Abraham Ortelius’s map of Iceland will be included, famously and prominently featuring one of the most beloved aspects of seventeenth-century map-making: sea monsters. 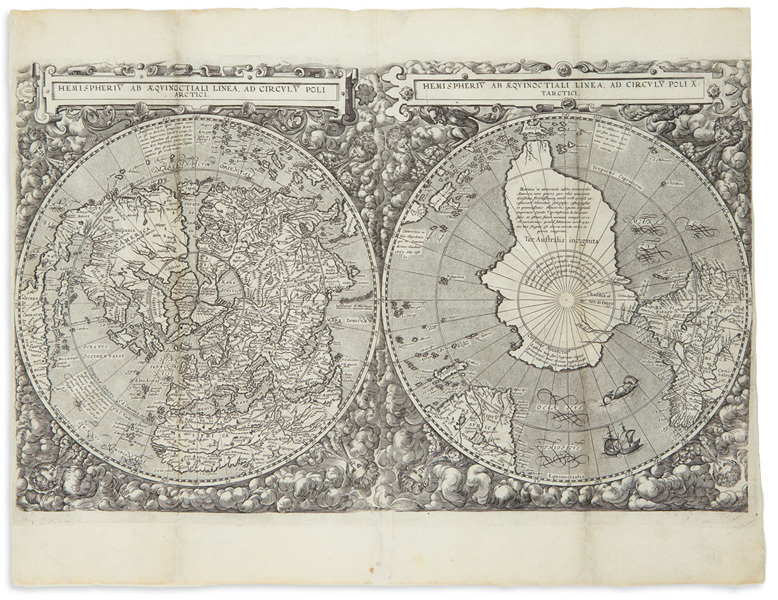 Lot 164: Abraham Ortelius, Islandia, double-page hand-colored map of Iceland, Antwerp, 1603. Estimate $3,500 to $5,500. 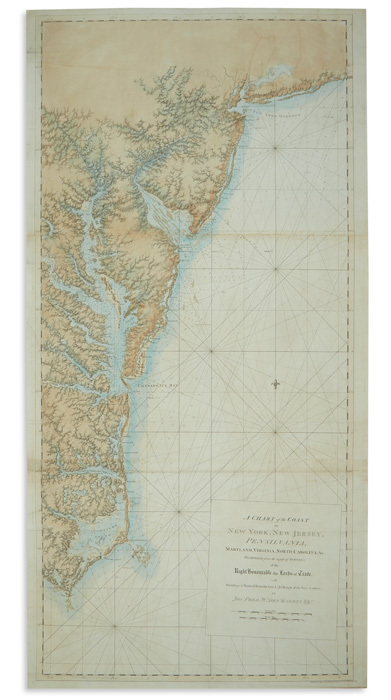 Lot 58: Joseph Frederick Wallet Des Barres, A Chart of the Coast, from the Atlantic Neptune, London, 1780. Estimate $18,000 to $22,000. Lot 53: Cornelis De Jode, Hemispheriu ab Aequinoctiali Linea, ad Circulu Poli Arctici, from Speculum Orbis Terrarum, Antwerp, 1593. Estimate $20,000 to $30,000. This sale will offer a wide selection of material, with a large run of early Japanese cartography, representing both the East and the rest of the world. 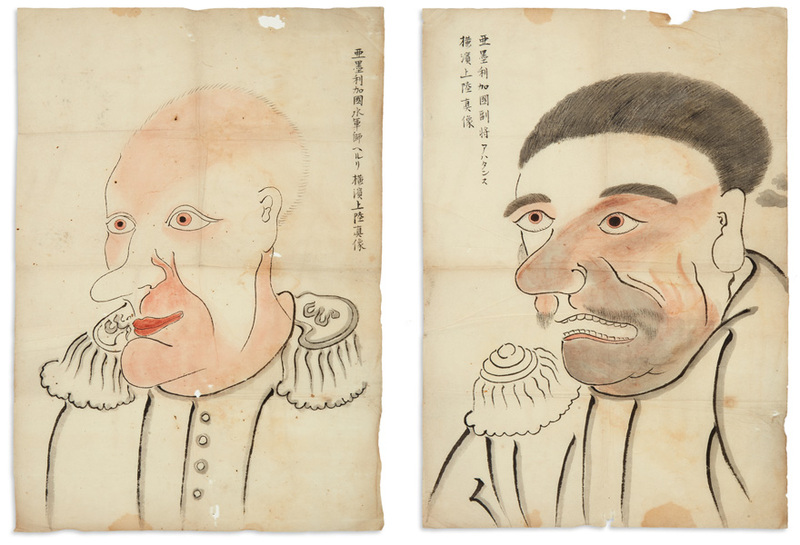 Lot 366: Manuscript report on the arrival of Commodore Matthew Perry, with two portraits of Perry & Commander Henry A. Adams, Japan, circa 1853. Estimate $2,500 to $3,500. 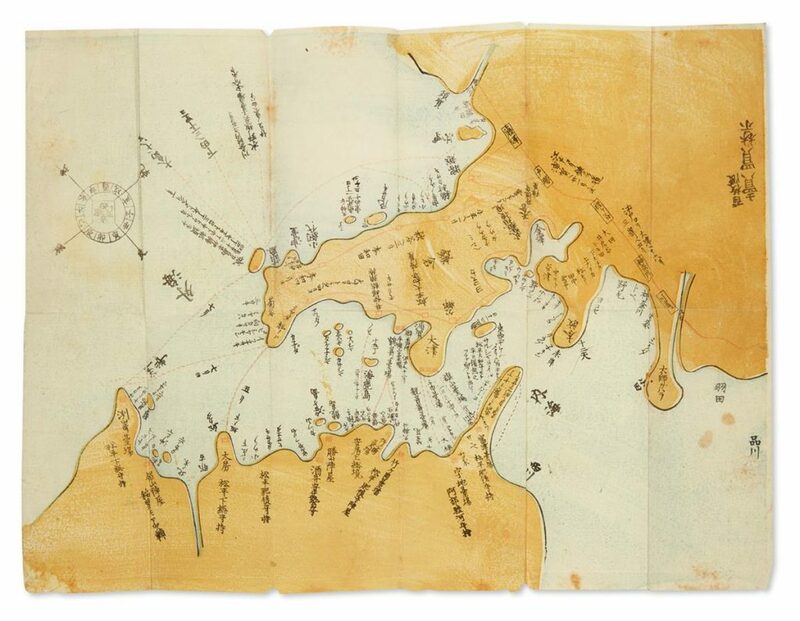 Lot 110: Color woodblock map of Uraga and Edo Bay showing the course of Commodore Perry’s Black Ship squadron, Japan, circa 1854. Estimate $7,000 to $10,000. 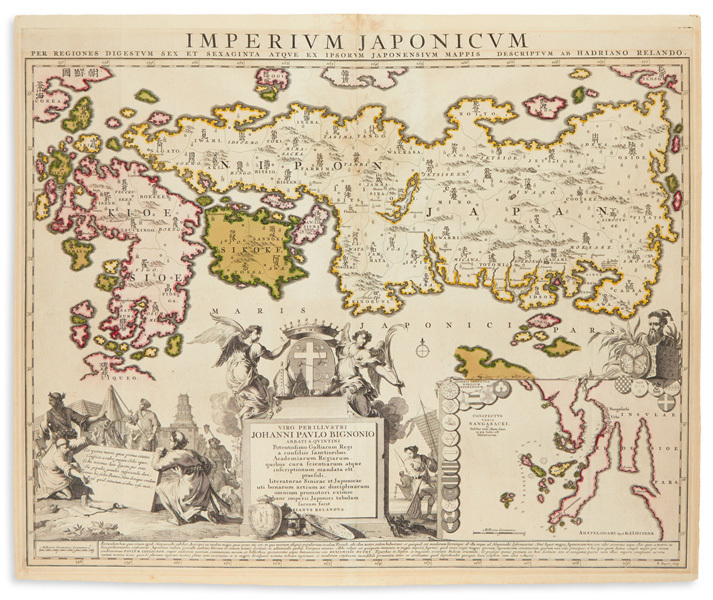 Lot 106: Adrian Reland, Imperium Japonicum, first European map to use Sino-Japanese characters, Amsterdam, circa 1740. Estimate $1,000 to $1,500. 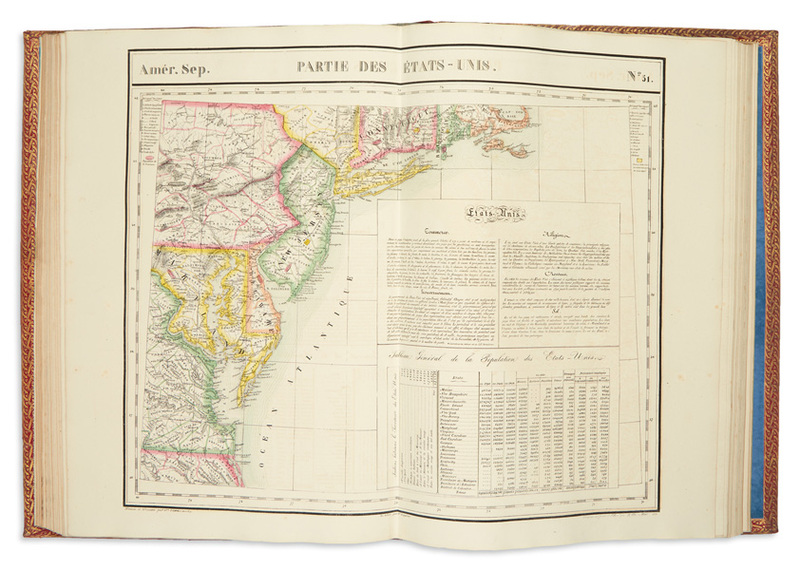 Lot 265: Philippe Vandermaelen, Atlas Universel de Geographie Physique, Politique, Statistique et Mineralogique, North American volume of the first atlas to use lithography, Brussels, 1827. Estimate $6,000 to $9,000. 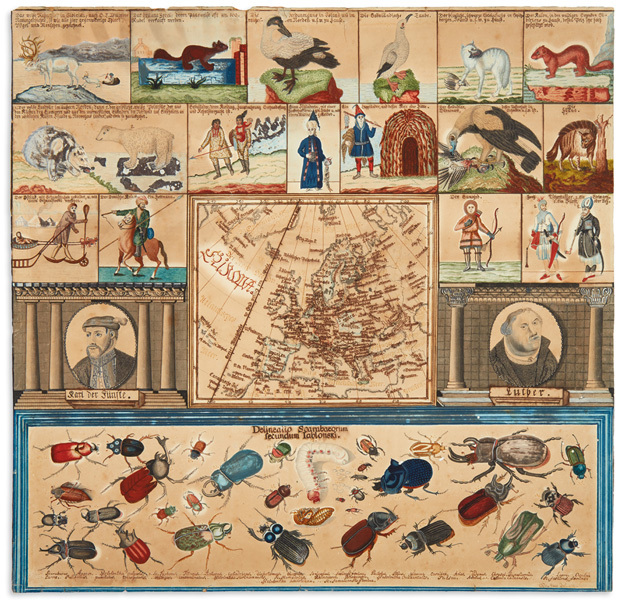 Lot 122: Odo Staab, didactic manuscript map of Europe, ink & watercolor, Germany, 1813. 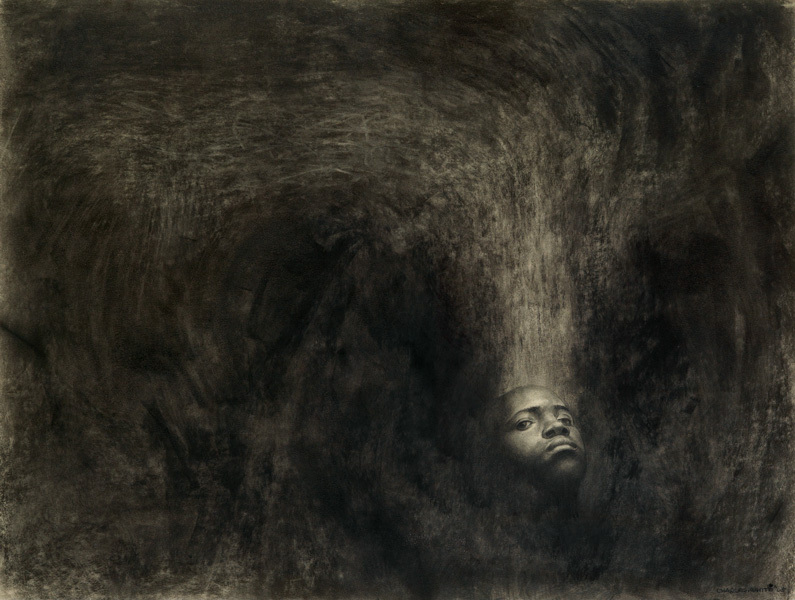 Estimate $800 to $1,200. 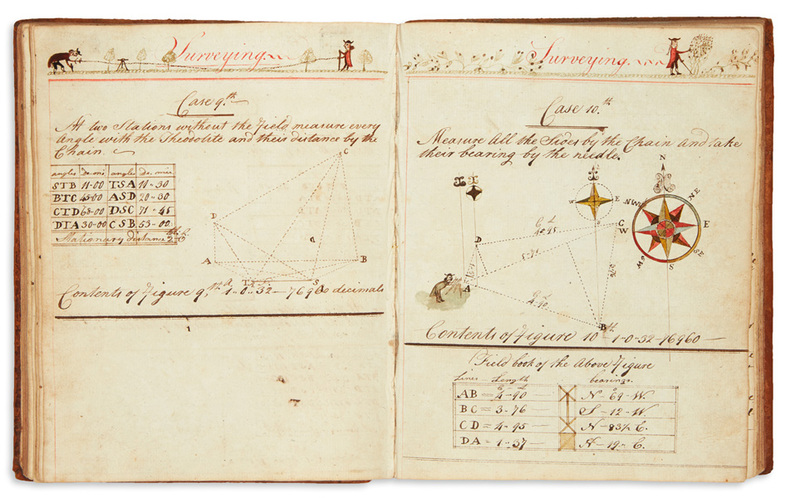 Lot 279: William Greene, manuscript ciphering book, Cambridge, MA, 1783-84. Estimate $800 to $1,200. 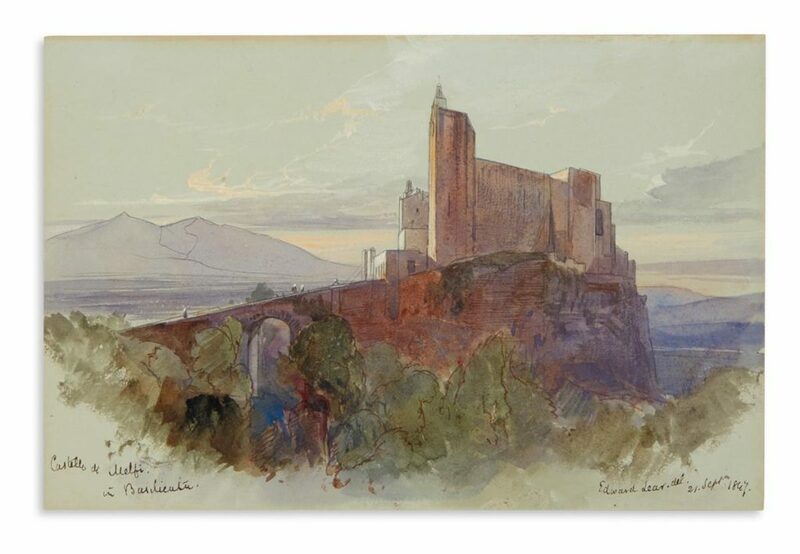 Lot 372: Edward Lear, Castello di Melfi in Basilicata, ink, graphite & watercolor, 1847. $3,000 to $5,000. 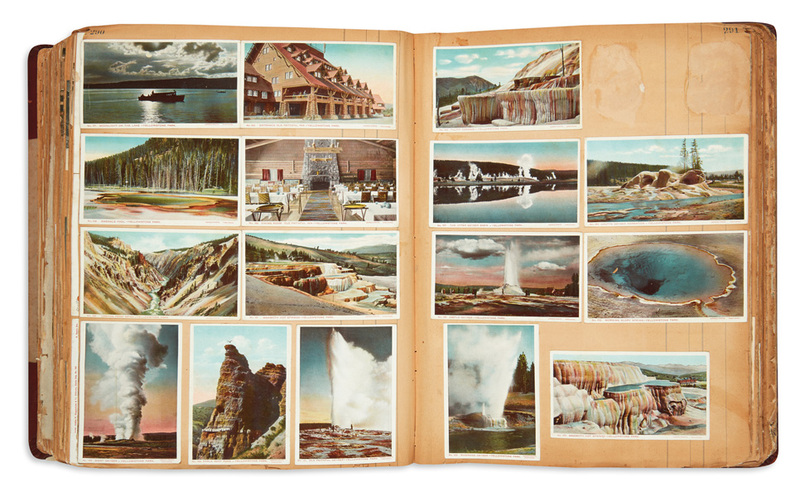 Natural history, color plate books, and an example of one of Currier & Ives’ most alluring lithographs, previously owned by Americana-collecting legend Thomas Winthrop Streeter, will also be available for bidding. 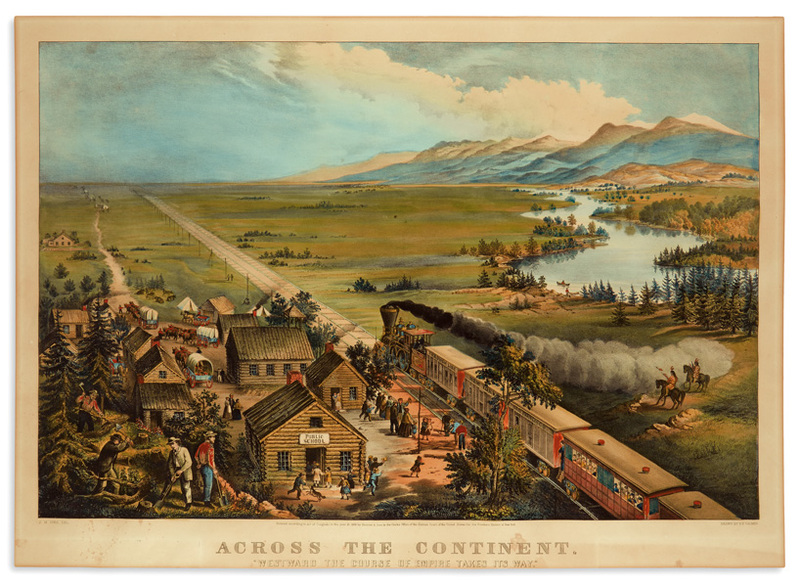 Lot 342: Currier & Ives, Across the Continent / Westward the Course of Empire Takes Its Way, hand-colored lithograph, New York 1868. Estimate $7,000 to $10,000. 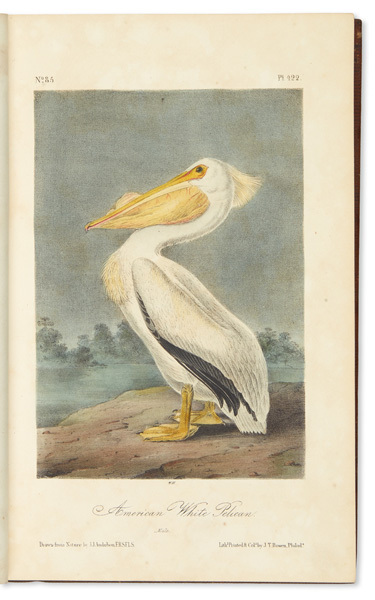 Lot 270: John James Audubon, The Birds of America and Quadrupeds of North America, together in 10 matching octavo bindings. Estimate $20,000 to $30,000. 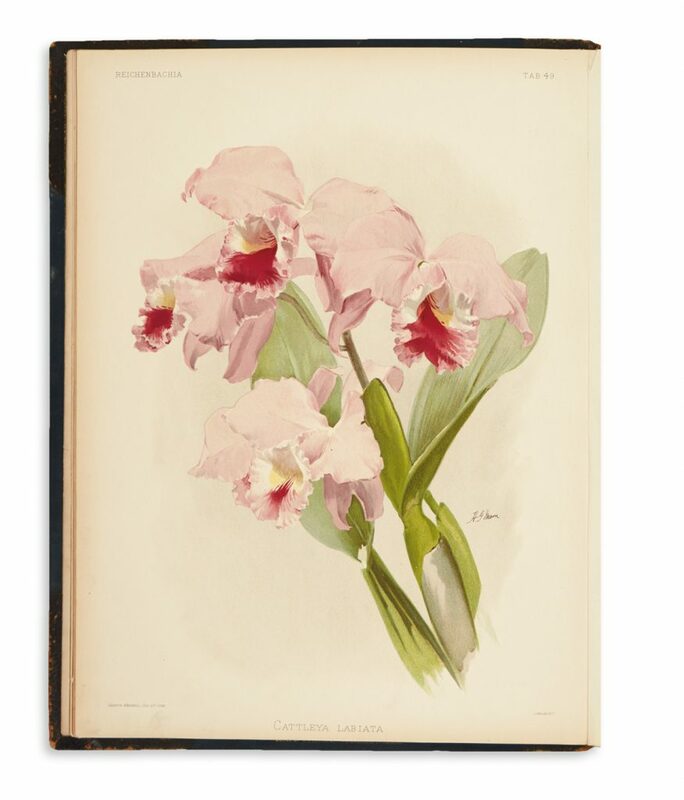 Lot 306: Frederick Sander, Reichenbachia, Orchids Illustrated & Described, in four volumes, St. Albans, 1888-94. Estimate $5,000 to $7,500. 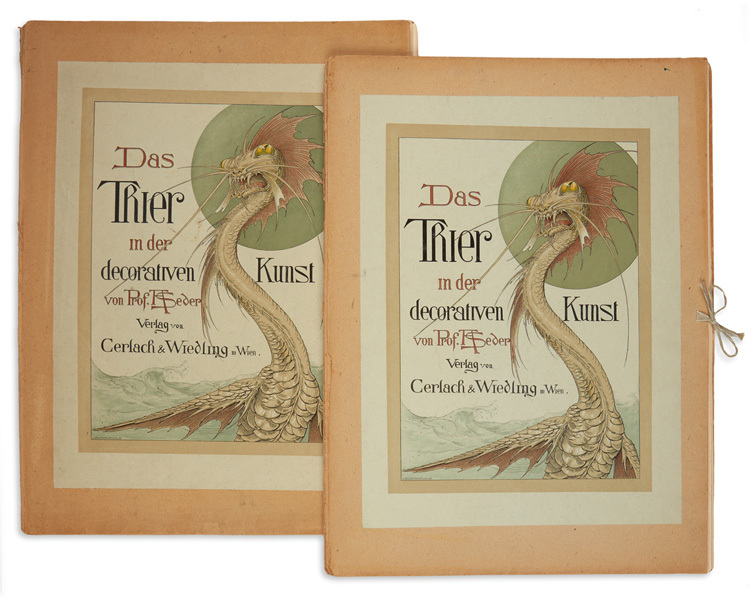 Lot 311: Anton Seder, Das Trier in der Decorativen Kunst, portfolio of 29 lithographs, Vienna, 1896-1903. Estimate $2,000 to $3,000. 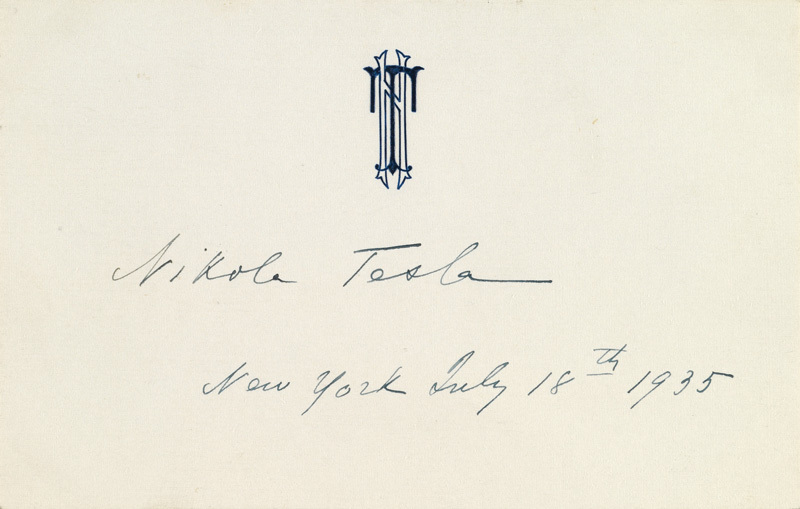 Lot 383: Album of approximately 2500 wide-ranging postcards, early 20th century. Estimate $700 to $1,000. For more information on the sale, contact Specialist Caleb Kiffer in the Maps & Atlases department.